Being a mother of seven busy children was a BIG job. One of the difficulties I ran into was managing all the mess and work that comes with a family. Believe me, you don’t have to have seven kids to figure out that a family takes work. I do a lot of mentoring with mom’s and dads who feel a bit over the top with managing all that they have on their plates and still finding time to enjoy being in their homes with their families. One thing that we always take a good look at, as we analyze feelings of frustration or anger, are family systems. I had a mom tell me that one thing that really got her down was that after dinner everyone scattered and she was faced with cleaning up the mess by herself. She felt she was in this bad place because she didn’t have a system. Here was the real problem – she had a system that didn’t work well for her. The system that she and her family were using was that after dinner everyone scattered and mom was left to clean up. Yup, that was their system. It was a system by default but a system none the less. Flying by the seat of your pants is uncomfortable! When looking at family systems I have a parent make a list of the top three things that happen in a day that cause them to feel like leaving home, you know, those times when they feel most frustrated or angry at their children or family. Then we take a look at what system is being used. We take an honest look! Once we know what has been happening over and over we can design an experiment to determine what might feel and work better. I LOVE experiments! When a scientist wants to see if they can get a certain outcome they design an experiment. If they don’t get the outcome they want then they try something else. The scientist doesn’t berate him or herself at the end of a failed experiment. They just try another experiment. But moms and dads can be pretty hard on themselves if something doesn’t work out well the first time. Maybe that’s why we fly by the seat of our pants so often and have systems by default. We don’t want to fail. But as I said, you can’t fail with an experiment because, that what it is, an experiment. So, begin taking a hard look at your family systems. As I help someone design an experiment we take into account their desires, energy level, family personalities, etc and come up with something that has a chance to work in their family. Over the years I have seen many successes. 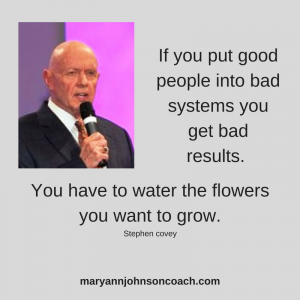 I devised some very successful systems over the years to manage my own life and family. They worked for me but they may not work for your family. But I want to get you thinking about your own systems. With seven kids clothes and towels can become a chaotic mess. I was doing piles and piles of laundry every week. I couldn’t keep up and realized that I need to upgrade whatever system it was that we were using. My experiment had three prongs to it and although parts were certainly not what most people would choose, it worked for our family. 1. One of the items of clothing that became problematic was pajamas. We had a really terrible system. You wore them, took them off, dropped them wherever, and then the next night you got clean ones. Yup, that was our laundry clogging system. So I put hooks on the kids’ walls. I didn’t feel that we needed clean pajamas every day. So in the morning they hung them up and put the same ones on at night. If they ended up on the floor then you had to wear them anyway. PJ’s were good for at least 3 days. It really helped cut down on laundry. 2. Towels were another issue. Often towels ended up on the floor, and remember I had seven children. By morning, especially in the summer, the towel was sour and headed for the laundry. Uggggggh I hated that because 4-7 towels a day was excruciating. So I added another hook for their towel. I gave each child a towel and it was the only one they got for a week. If hung up it was good for a week because it was used to dry a clean body. I didn’t give in to cries of, “But my towel stinks.” If your towel was on the floor and got stinky you had to earn another towel. It wasn’t a very popular system but it worked and the kids soon learned to hang up their towels. 3. Here was the third prong to the new system – when you were 12 you did your own laundry. I took the time over a number of weeks to help a new twelve-year-old learn how to do their laundry. Then they were on their own. I didn’t monitor their laundry. There were a few times that someone had to borrow underwear from a sibling or wear a dirty uniform to gym class but it was a great learning experience and everyone got better at it. I had different systems for getting kids to clean their rooms over the years. As their ages changed so did our systems. At one time I had five kids over 12 and under 18. Their rooms were horrible and we didn’t have a system at that time that was working and I was weary of talking and cajoling to get older children to manage the mess. •Your mess cannot spill out into the hallway. •If you choose a mess you have to keep your door closed. •If it smells you will have to take an evening or afternoon off and clean your room. No activities until the smell is gone. •Every bedroom has to be put in order once a month. You can do it or I can do it. If I do it then I get to decide what stays and what goes. I know lots of moms are gasping right now but I love cleaning and I loved getting my hands on those kid’s rooms. : ) This was very workable for me. I had two sons who couldn’t care less about their stuff so, often as not, I picked up their rooms once a month and I chucked a lot of junk. It felt fabulous. I had a third son who cared about all of his stuff and I rarely had to go into his room. Two of my daughters fell into this over 12 under 18 category and for the most part, managed their own rooms because they didn’t want me messing with their stuff. Sometimes, as I began a room a horrified teen would come running in and say, “I got this mom.” You may think this was a terrible system but it worked for us. And that is the point, do you have systems that are working for you and your family? If you find yourself feeling overwhelmed and angry at your family or children then take a look at your systems. •Write down the top three things that make you most upset with your family or children. •Stick with three items because what you want is movement, not overwhelm. •Narrow your list to the one that you want to change most. •Honestly look at your current system. Acknowledge those that are systems by default. •Design and experiment with a new system based on your desires, energy, family personality, etc. •If it works great, and if not, go back to the drawing board. Design another experiment. •Remember, whatever you can get your family to ‘buy into’ they will take more ownership of and it will work better and longer. •Be clear that very few systems work forever and be open to new experiments every now and then. When we take responsibility for how we feel and stop blaming our family or kids, then we can come up with solutions that help us feel better. We will be able to look at our current systems honestly and design something that works.